FixWin 10 is an update to the popular FixWin application that introduces several Windows 10 specific repair options to the application. We have reviewed FixWin back in 2010 when it was released to the public and came to the conclusion that it is a useful troubleshooting tool for devices running Windows. 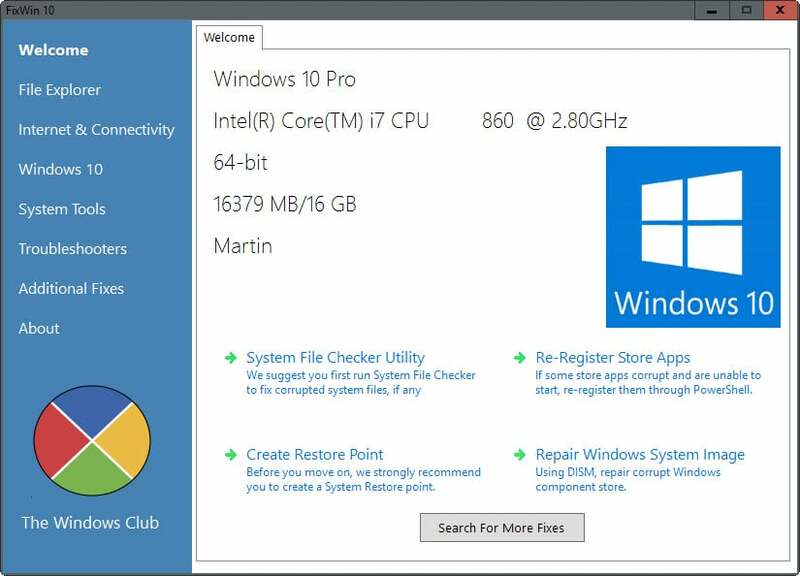 The update delivers more of the same include a setting reserved solely for Microsoft's latest operating system. The program requires the Microsoft .Net Framework 4 but no installation. The interface itself has been updated slightly with a modern look. Information about the underlying system are displayed on start. There you find fixes for common issues listed as well, for instance to register all store apps again to make sure they are available again on the system and functioning properly. If you have removed an app accidentally for instance, it can be helpful to regain access to it. 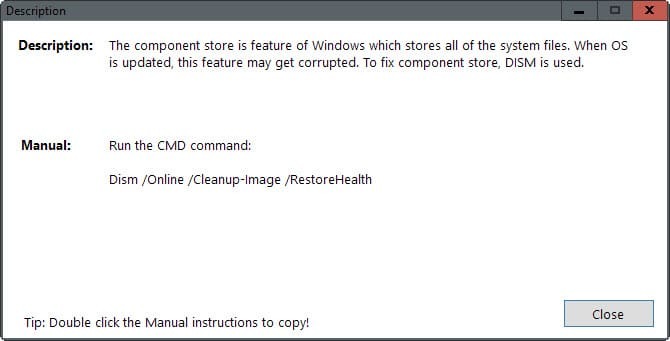 Repair the Windows Component Store using Deployment Imaging and Servicing Management (DISM). Reset the Settings app. Useful if it does not open anymore or crashes. Repair the Windows Start Menu. Handy if it does not work properly or does not open at all. Repair WiFi if it is not working. Fix Windows Update stuck downloading updates after upgrading to Windows 10. Clear and reset the Store cache to resolve issues downloading applications from the Windows Store. Fix "The Application wasn't installed" in Windows Store, Error Code: 0x8024001e. Fix Windows Store apps not opening. Registers all apps anew. The remaining options appear to be more or less identical to those provided in the previous version of FixWin. One great feature of FixWin 10 is that you get instructions to run the fix manually as well. All you have to do is click on the help icon next to each fix to display information on what it does in detail, and instructions to run it manually. The manual approach usually comes down to one or multiple commands that you need to run from the command line or PowerShell. To make things easier, it is possible to double-click on the manual instructions to copy them. I like this option a lot since it allows me to check the fix before it is applied. I always have a hard time trusting applications when they don't reveal what they do in the background to fix an issue. Since FixWin details that, I find it much easier to trust it in this regard. If you run into one of the issues that FixWin 10 can repair, then you may want to give it a go as it may fix the issue for you in that case. It is up to you to run the fix from within the interface or manually. The manual approach may take longer but it has the added advantage that you know what to do next time without running the program at all. Same here as Sidhu. Thanks. Why not use just sfc /scannow and for other problems the official workarounds by MS ? Microsoft don’t provide solutions to every Windows problem. But I collected my experience and made FixWin so people can easily fix common problem with Windows. I get a Trojan virus warning outlined in red. Please advise. It is very-likely a false positive. Any way to know for sure? I am the developer of FixWin 10. I assure you that it’s not any type of virus or malware. FixWin changes system files to fix problems. Hence your antivirus is flagging it. The Windows Club is a trusted place to download freewares for your OS. You can google my name or The Windows Club. You will automatically trust it, after it. I upgraded to win 10 but it didn’t recognize the dvd drive ,will this fix this. I went back to 7 until I can get a fix. I installed VirusTotal, in order to run it on the downloaded file, but Windows declares it a Trojan and quarantines it before I can do anything. The makers need to address this, as it is far too much work for most people. Can I boot to this? Or is this a program you run in windows? My PC crashed last night and I can’t get it to boot anymore. Hoping to avoid having to do a fresh install. My windows 10 mail stopped working suddenly. I uninstalled it and again reinstalled from stores. However it continues not to work. the various e mail options screen opens but after trying to log in it show an error code 0x80040154 and that is all! Remote repairs by Microsoft help technician also could not solve it. Will your suggestion here work for me?